Remember that special occasion that had to be moved indoors when the unexpected rain and wind crashed the party? 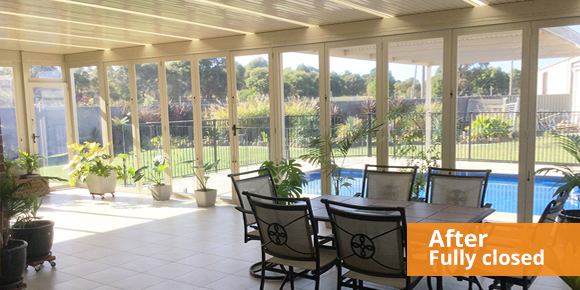 Close your Patio area up in the Winter & warm it up. 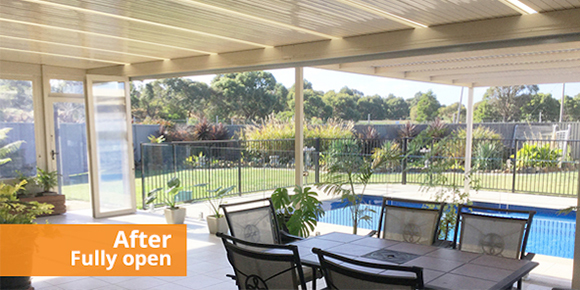 Open it up in the warmer months & Enjoy as A fully open Patio. 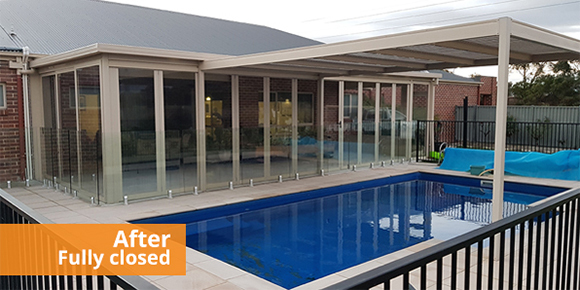 Made from clear polyvinyl infills with wind & rain protection. Get In Early & Get Rewarded! 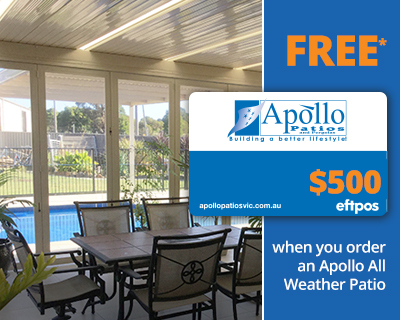 Order your Apollo All Weather Patio including Apollo All Weather Screens before 31st May 2019 & receive a $500 Eftpos Gift Card. Don’t miss out on this exciting opportunity, register your interest Here. We look forward to hearing from you. Click here for full Terms & Conditions**. Security & Peace of mind. Why wait? 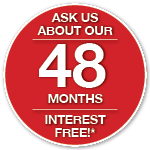 With 48 months interest free available you could be enjoying your new outdoor home addition. 1. This offer is valid from 1st January 2019 to 31st May 2019. 2. Definition of a “Apollo All Weather Patio’ is: a full construction of an Apollo Patio that includes “Apollo All Weather Screens”. 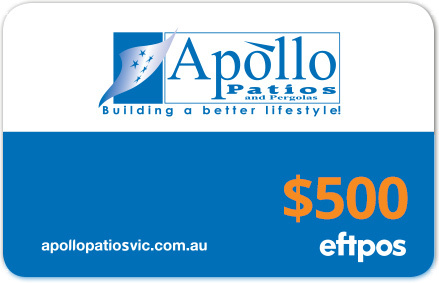 3.The purchaser will receive the $500 eftpos card when the construction of the “Apollo All weather patio” has been completed and all payments have been received by Apollo Patio Victoria as per the contacted agreement. 4.The Promoter, it’s employees and its agencies associated with this offer are not eligible to enter this offer. 5. 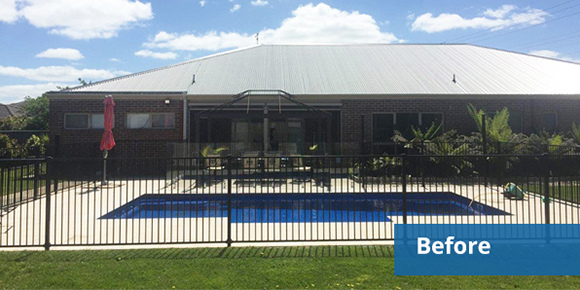 The eligible participants will receive their eftpos gift card via Australia Post. 6. Apollo Patios Victoria takes no responsibility for any delays in delivery time of the prize. 7. The Promoter is Apollo Patios Victoria. 8. All personal information of the person/persons taking up this offer become the property of the promoter. 9.The eftpos gift cards cannot be used to withdraw cash at ATM or eftpos nor be redeemed for cash, reloaded, returned for a refund, or have their balances transferred, consolidated or replaced. 10. The eftpos Gift Card WILL EXPIRE ONE YEAR after the date of issue. Any balance that remains after the expiry date will not be available for use and will be forfeited by you. 11. Lost, stolen or damaged cards will not be replaced or refunded.